Fossils Found : Mongolia, China. Protoceratops walked on four legs, had a large head, a bulky body, a parrot-like beak, cheek teeth, and a small frill on its head. Males may have had larger frills than females, indicating that the frill may have been used in courtship and mating. Protoceratops was about 6 to 8.2 feet (1.5 - 2.5m) and weighed roughly 900 pounds (400 kg). lt was about 3 feet tall (to the top of the shoulders). Protoceratops lived in the late Cretaceous period, about 86 to 71 million years ago, toward the end of the Mesozoic, the Age of Reptiles. Protoceratops was probably a herding animal, like some other ceratopsians. This hypothesis is supported by the finding of bone beds, large deposits of bones of the same species in an area, and large groups of nests. Each nest had 12 or more eggs, laid in a spiral fashion. Sexual dimorphism (the physical differences between the sexes) in frill size has also been noted, with males may have had larger frills than females, indicating that the frill may have been used in courtship and mating (P. Dodson, 1976, Journal of Paleontology). Protoceratops was an herbivore, a plant eater. lt probably ate cycads and other prehistoric plants with its tough, hook-like beak. Protoceratops walked on four short legs; it was a relatively slow dinosaur. Dinosaur speeds are estimated using their morphology (characteristics like leg length and estimated body mass) and fossilized trackways. Protoceratops was first discovered in the Gobi Desert in Mongolia in the 1920's. It was named by Walter Granger and W. K. Gregory. Numerous fossils have been found, from eggs in nests to juvenile to mature specimens. Sexual dimorphism (the physical differences between the sexes) in frill size has also been noted, with the adult male possibly having a more pronounced frill than the adult female. A fossil of Protoceratops has been found with one of a Velociraptor; the Velociraptor had been attacking the Proroceratops, which had butted in the chest of the Velociraptor. Protoceratops was an ornithischian dinosaur, the order of bird-hipped, herbivorous dinosaurs. It was a Ceratopsian (a suborder of frilled, herding herbivores, that include Triceratops, Styracosaurus, etc. 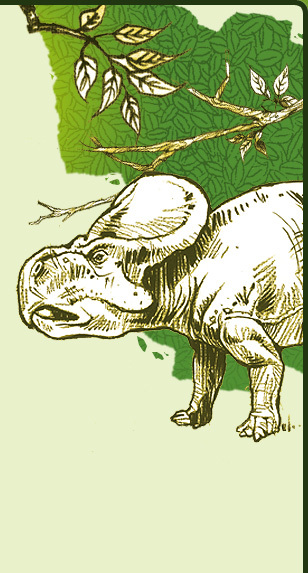 ), and a Protoceratopsid (an early ceratopsian, which included Montanoceratops, Leptoceratops, and others).